“When is your science fair?” I asked the Boy one cool evening not long ago. “I don’t know…” he responds. Ooops. Hope it isn’t tomorrow, because we aren’t ready. 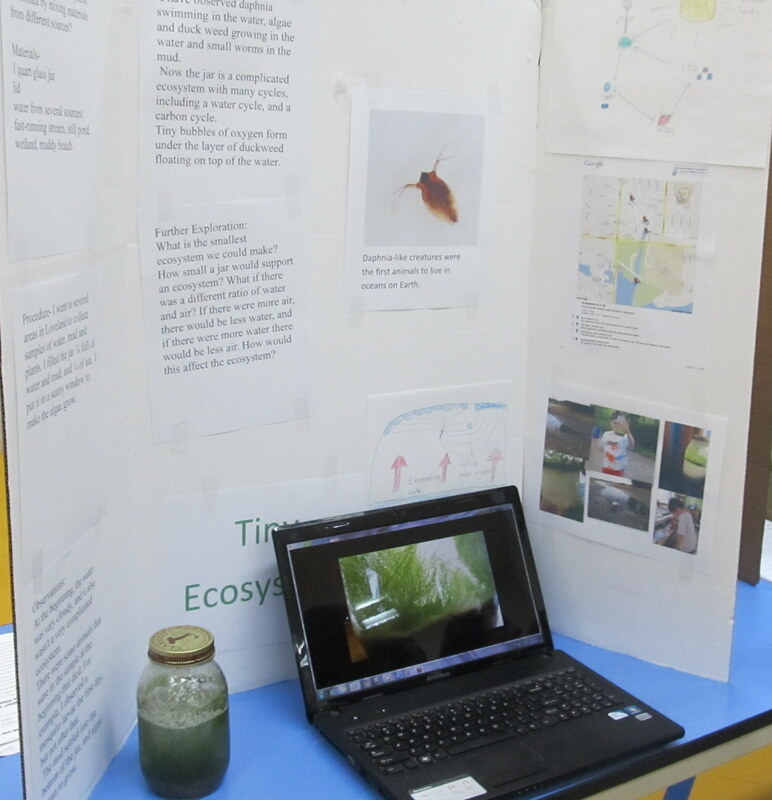 He loves weather, and nature, and dinosaurs, and is getting into chemistry, and so there is a lot of pressure to have a really amazing science fair project. Pressure from his peers, but also from himself. We brainstorm, and come up with things…then we get distracted by something shiny. It turned out that the Science fair was a few weeks away, so we had time to follow through. So, the decision for this year was to examine the life growing in the jar of pond water we collected last summer . The 1 quart jar has been in his west-facing window, growing algae and stuff. Look- follow through! With a map and a video and everything! When we first collected the samples, we didn’t intend to make it a science fair project. I had read about the project in a garden book, and when I told the Boy about it, he thought it was a neat idea, and nagged me about it until I got a jar, and went with him to the park. We took a video of the little critters that are swimming around, and looked at them with our thrift store microscope. With help from the interwebs, he determined that they were daphnia. The science fair was a success- there was the usual supply of baking soda volcanoes, and several decomposition displays. The Boy was the only one to have a jar of tiny critters with a water cycle. Our school fair is non-competitive- just an exhibition, not a competition. This was on someone else’s display. 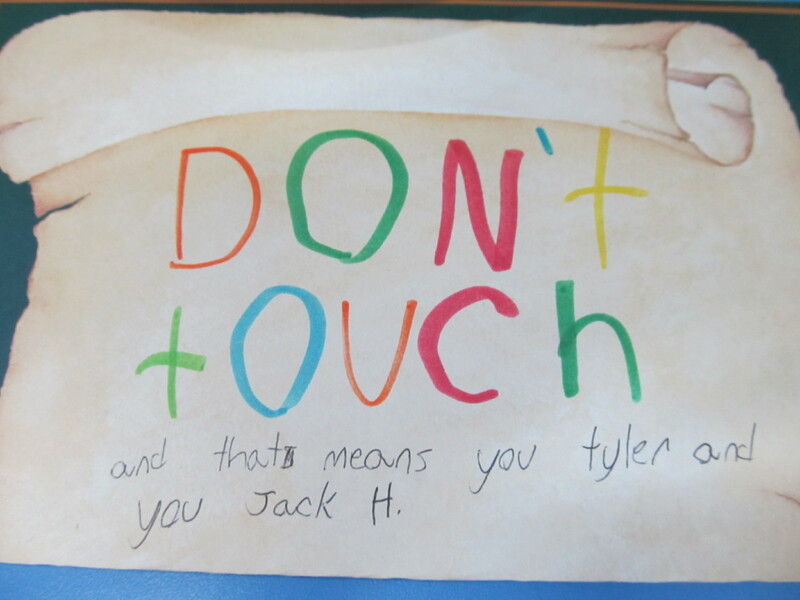 Now, I don’t know Tyler or Jack H., but I am pretty sure they touched it. Now we have to think about next year. Ah, Will’s project takes me back to my own science fair days! My first year, I, too, investigated a jar of pond water and discussed the life I found inside the jar (I found a hydra and an amoeba my first year!). When I got my project to the science fair, some idiot boys banged into my table and my project went crashing to the floor. It was devastating, but a motivator to soldier on that year and in future years nonetheless. So, in conclusion, I like the “Don’t Touch” sign. Solid idea. LOL- I don’t think the sign worked- it just struck me funny that the kid knew who exactly would be messing with his project. Will is so awesome. Did Jeff tell you that I was thinking about Will recently when termite pupae started birthing out of a hole in our bathroom wall? (Shudder) I started collecting the newly hatched termites in a baggy to show the exterminator and thought, “I bet Will would love this!” Ha ha. That is amazing! And horrific!